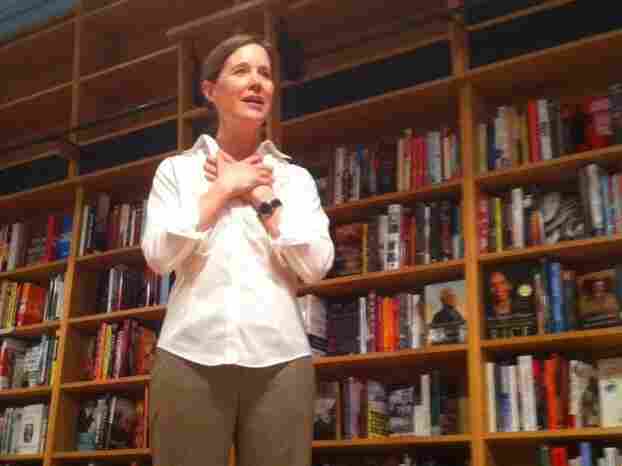 Author Ann Patchett Opens Own Indie Bookstore "I think of this as my gift to the city," the best-selling novelist says of her Nashville book shop. "If I want to live in a city with a bookstore, then I'm willing to pay for it." Patchett shares her first-day jitters, and the best advice she got about opening a bookstore: Put the children's section in the back. 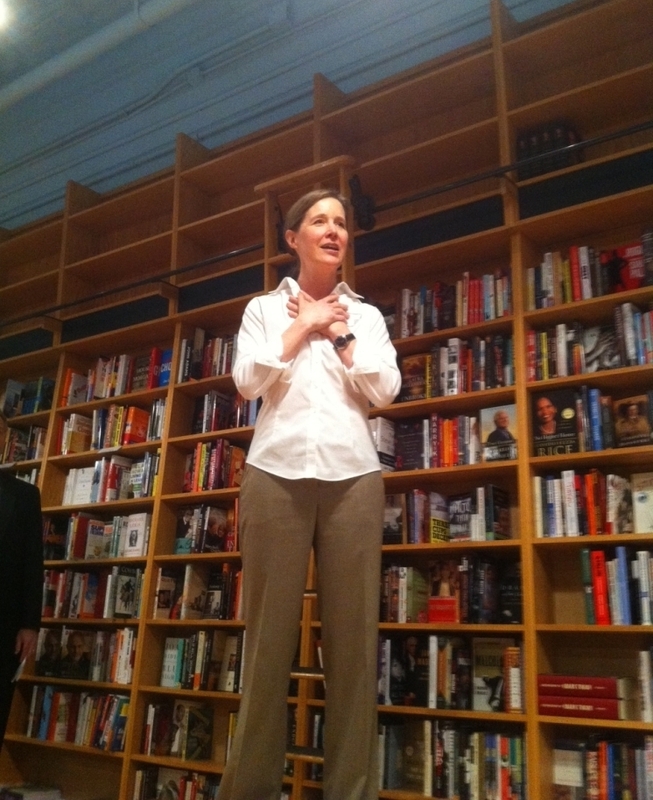 Novelist Ann Patchett greets some of her first customers at Parnassus Books in Nashville. "I actually think this is going to go really, really well," she says. "It is beautiful, Melissa; I wish you were here. The ceiling is incredibly high, and it's pale blue, and the walls are very warm, and we have floor-to-ceiling bookshelves. It's opening day, but we're still doing a lot: We're filling up the card rack right now and the magazine rack and learning how to use the cash register. It's exciting. It's crazy." 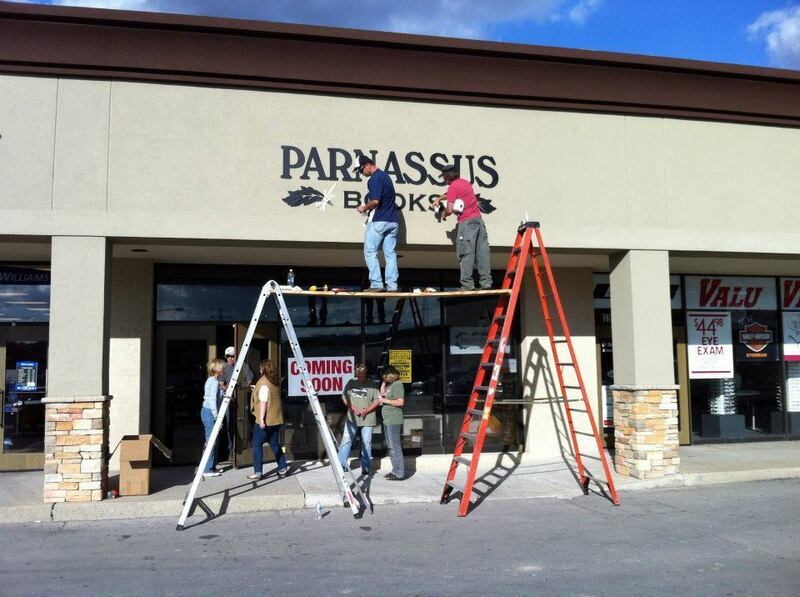 Parnassus in progress: Workers put some final touches on the front of the bookstore. The store is named after Mount Parnassus, home of literature and learning in Greek mythology. "People are really coming all the way back around to the beginning of the [big-small bookstore] cycle and saying: I want the little store. I miss the little store. And I think there are a lot of small stores that can really thrive in this environment." "I feel nervous like first day of school, not nervous like I'm embarking on a business venture that might go bust. I actually think this is going to go really, really well." "I think of this as my gift to the city: This is what I want to see in Nashville, and if I want to live in a city with a bookstore, then I'm willing to pay for it. ... The big work of the store is really being done by my partner, Karen Hayes. It's easy enough to put your money into something, but she's putting her back into it. That's what's really important." Getting organized: The children's section gradually takes shape. "Put the children's section in the farthest back corner of the store, so if the kids run away and make a break for it, you have plenty of time to catch them before they get out the front door." 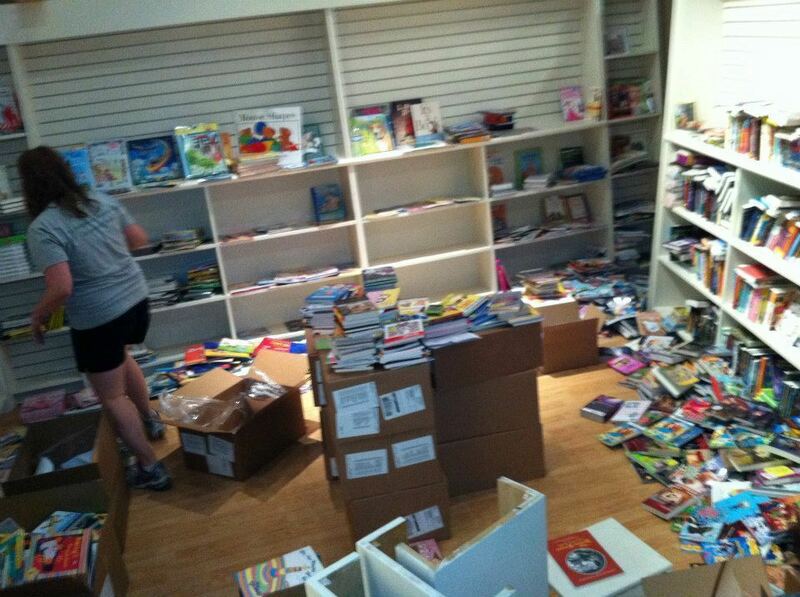 "In a smaller store ... you are the person making the choices to get really good books. You are the one who, by your intelligent ordering and good reading, is sort of cutting through a lot of the junk and bringing books that people really want to read. ... We've all had the experience of going into a three-story Barnes & Noble and saying, 'I didn't really find anything I wanted to read.' But you can go in to a small store with an intelligent staff .... [and] well-displayed, well-chosen books, and come out with five books that you're dying to read. And that's what we're going to do." On the story behind the name "Parnassus"
"It is that mountain in Greece where literature and music and poetry were born. We are the Athens of the South here in Nashville — we have a full-size replica of the Parthenon. And so we wanted to be part of that great tradition of our city."